Eek! – My wife is going back to work full time! For the first eight years of our children’s lives, my wife and I played our stereotypical gender roles. 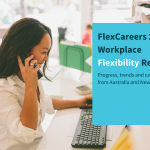 I was working pretty long hours in banking, and now building FlexCareers, Emily wanted to take on the primary caring responsibilities for our kids as a full time mum. That worked for us individually, as a couple and as a family. Over the past few months though, something sparked a fire in her belly to return to work. Whether seeing all these people go back to work through Flex and hearing all their stories, speaking to her own friends, or seeing the broader social wave of women’s participation in the workforce rise, one thing is for certain – she was hungry to get back to working again. She started a flexible full time job this week. These are some of the things I have learnt through our return to work experience. This is for the husbands, the partners, the fathers out there. You will be really proud of her, but now is not the time to get too excited, there is lots going on that is not immediately evident. She will be feeling a mix of giddying excitement, fear of failure and gut wrenching guilt at ‘abandoning’ the kids. This is about her, not you, and you need to let her talk. Time to get good at listening. You will both be tired, especially her. Constantly. At least this tired is not as bad the early baby phase tired – less white noise, more like a treadmill of never-ending jobs to do around the house when all you want to do is flop on the couch after a long day at work. Your children will never wear another matching pair of socks to school, because you never folded the bloody washing. See 2. And that’s OK.
You will be shocked at the cost of childcare. Our kids have always had their mum to look after them in the school holidays, and before and after school, so other than the odd ‘date night’, we have never had to pay for childcare. As such I never appreciated the cost of getting quality care for my kids. There is not that much change from a second salary during school holidays – but there is not much you can do, so just accept it and move on. 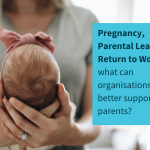 Returning to work has been a huge event in my wife’s life, and has changed the way our family functions in a good way. The kids now have another way to view their mum as an awesome role model, but it is certainly not easy. Just remember to take it slow. You will work out how it works best for your family unit sooner or later. What did you find when your partner returned to work? How did it help you grow as a couple or a family? 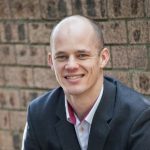 Joel McInnes is the Co Founder of FlexCareers, a platform where progressive corporates and those seeking flexibility at work connect. Joel’s wife, Emily, is going to work as an HR leader for an offshore technology company based in Sydney. They have three wonderful daughters. 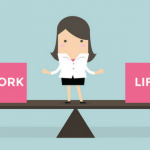 « ​Craft your career plan in 6 practical steps.